If you want a primer that doesn’t dry out your skin, Colorescience has you covered. Our primer for dry skin hydrates while providing a base to help your makeup last all day. What skincare ingredients are bad for dry skin? There are hundreds of skincare brands on the market claiming to treat dry skin, but which do you choose? Some products might make your dry skin worse, causing irritation that leaves your skin flakey and inflamed. Choosing the right skincare products make the difference between healthy, vibrant skin, and dull, patchy skin. When you shop for skincare products, read the label. Popular ingredients like retinoids and benzoyl peroxide can help clear acne, but for some, it can lead to peeling, itching, and redness. Drying agents like isopropyl alcohol, sodium, ethanol, or ammonium lauryl sulfate also dry out skin. If you have dry skin as a result of allergies, avoid frivolous ingredients like fragrances, which are known skin irritants. What moisturizer should I choose for dry skin? Keep your skin hydrated day and night with a nourishing moisturizer. A water-based moisturizer high in emollients lubricate the skin and lock-in moisture. Other ingredients, like glycerin and hyaluronic acid, also help replenish skin. These ingredients are key to maintaining a silky, glowing complexion. Choose a moisturizer with skin-friendly sunscreen to avoid sun damage and slow signs of aging. Can I wear makeup if I have dry skin? Yes! Our cosmetics for dry skin give you full coverage without the drying effects of other makeup brands. 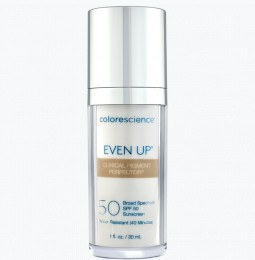 Colorescience dry skin mineral makeup powders are designed to help nurture dry skin while giving you a velvety, smooth complexion. Start by filling in fine lines and pores using our mineral face primer. Use our face mineral primer on its own or use it as a base underneath our dry skin foundation powder for matte coverage. Our products are made of natural, non-comedogenic ingredients that are gentle on dry, sensitive skin. We design cosmetics for every skin type. 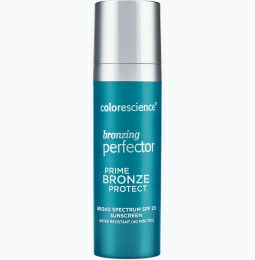 Whether you have dry, oily, sensitive, or combination skin, Colorescience cosmetics contain safe ingredients made to help you achieve a healthy, radiant complexion. Our mineral makeup is the preferred choice for people who want to fill in fine lines and even-out skin tone. From primer with oil control to powder foundation primer for dry skin, you can give your look a photo-finish with cosmetics from Colorescience.